Canning Roasted Tomatoes - Canning Homemade! Just a quick post to feature an inspiring idea for putting up your tomatoes this season. Stacey posted her jars of roasted tomatoes on my FB page this afternoon and the recipe is being requested as I type. I think that it will be a great way to add some sweetness from the roasting and a earthy flavor since they are precooked. Stacey did not peel her tomatoes after they were roasted before she filled her jars, but you have the option to if you want. One trick is once the tomatoes are roasted place them in a ziploc bag while they are hot and they will sweat releasing the skins as they cool. They will peel off easier before filling your jars. To roast your tomatoes you can use two methods. Broiling or baking at high heat (450 degrees) For this recipe they are broiled! Preheat your oven's broiler. Prep the tomatoes by taking off the stem ends of the tomatoes. Place the tomatoes on a broiler pan or baking sheet (jelly roll with sides will keep the juices from dripping in your oven) pan in a single layer on a baking sheet. Place under the broiler and broil until the tomatoes start to show blackened spots but are not burnt. Use metal tongs to turn the tomatoes over and put them back under the broiler until the other sides of the tomatoes start to char. Remove the tomatoes from the oven and either remove the skins or leave them on. You can remove the seeds, but it's not totally necessary. 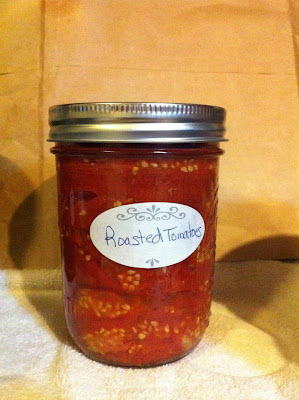 Pack the tomatoes into hot canning jars. After you have completely packed all the jars add 1 tablespoon bottled lemon juice per pint jar. This is to add the necessary acidity so that the recipe once water bathed is shelf stable. Using a spatula or chopsticks which work really well remove the air bubbles. If you have room you can add more tomato to fill to 1/2-inch head space between the tomatoes and the rim of the jar. Wipe the rims of the jars so you have a clean surface to add your hot lids/rings. Process the jars in a boiling water bath for 35 minutes. If you are doing these in quarts you must add 2 T. of bottled lemon juice to each jar and process them for 45 minutes in a hot water bath at a full rolling boil.